SEMA and Ethanol ... please read ..
Re: SEMA and Ethanol ... please read ..
I’ve read this a few times and haven’t decided how good or bad it may be. What I take away is it’s already against the law for me to drive my Mustang to any of my regular stations for fuel. Which I didn’t know!! There is a Buc-ee’s in Katy that sells ethanol free fuel. 60 miles round trip to top off the tank doesn’t sound real economical either. I think I will stick with the local Kroger’s. I guess the labels are too small, I don’t remember ever seeing one. Anyone think we will get a bunch of new stations selling the ethanol free stuff? Around me there are actually a few stations that sell ethanol free. There is one outfit that all of their company owned stations are all ethanol free. All of the Cenex's around me have ethanol free 91, but the cheap stuff is 10% there. There is also one station about 6 miles away from me that has ethanol free 91 and 102 unleaded at the pump. I suppose that isn't the norm for a lot of folks. I was surprised when I started looking around to find so many stations that had at least one ethanol free option. Seems odd that you are prohibited, my guess is that it's more related to rubber hose safety over anything else, but in the end, this sorta sounds like the results of guys like us bitching about Ethanol. What an odd new direction. My current (slooow) build is intended as an E85 project, but there's no telling what will be available by the time I finish. I won't commit on the fuel system until as late as possible, but I really hope all the Exx options stay. There's an E85 pump about a mile from my house currently...one of only two in a 40 mile radius. I'm with Ross on this. For all the hubbub about Ethanol, I just haven't seen anything bad enough to get excited about. My daily driver has an FE and Holley, and just haven't had a problem yet. I run whatever E15 is at the pump. I think the problem is more to do with old worn out stuff, crappy subpar rubber, or mystery Chinesium Alloy, and so folks blame it on the fuel. Now, that said, I do not believe I have to deal with "winter fuel" where I live. So I have no knowledge of that being formulated differently and what the effects are. I am not sure about other states but in AR all the Murphy Gas Stations offer 91 Oct. Non-Ethanol. A cool trick to test your fuel is snag a plastic water bottle put a small amount of water in it. Add a decent amount of fuel and shake. Real Gas will not bond with the water and once it settles there will be two separate parts. Ethanol fuels will bond with water and there will be 3 parts once it settles, one fuel, one fuel and water, and one water. That is where I have the issue. On two strokes this is more dangerous as far as severe instant damage. It can happen with regular gas but under most conditions the engines will not run at all and thus can't damage themselves. The problem comes from water getting in the fuel from long term storage or issues with a tank at a station or improper handling. Daily drivers etc. would normally never see a problem with it unless it was a bad tank at a station...fuel in, fuel out pretty quick vs. sitting/storage opening the door for water infiltration. For older vehicles the components in the fuel system are not designed to resist rust/corrosion or attacks from alcohol. Add to that most sit for extended periods of time and thus the fuel can wick moisture from the environment making for all sorts of issues. I for one wish they would not make the stuff. There is no benefit to Ethanol when you really dig into it and look at what is involved for day in day out use. Most companies switch back and forth and we never know. It all depends on the costs...if making E-fuel provides a savings they do it and vice versa. My point being that this is why it says "May contain" etc. Not sure legal reps would really argue the point....most follow the money. My truck gets started at 2am, I drive to the airport (70 miles), park it, disconnect the battery and the truck sits in a parking lot for 28-35 days. It rains, snows, gets to be 110 degrees, etc. When I get back, I crank for 10 seconds, work the accelerator pump manually to make sure there is fuel in the bowls. Two pump shots, crank and she's running. I feather the throttle for 30 seconds (no choke), test the brakes, lights, turn signals, and am back on the highways driving 70 miles home. This is theoretically the worst possible situation for fuel that does what you say. and yet 11 years of doing this and I have not had one fuel related issue. [quoteThis is theoretically the worst possible situation for fuel that does what you say. and yet 11 years of doing this and I have not had one fuel related issue. Drew I am glad you haven't. Not sure of the point you are trying to make with the wording of that statement but to each their own. To clarify I did not say Ethanol would absolutely/instantly cause issues. I don't think anyone will argue that water in fuel is a bad thing. Also, it could be your fuel isn't E-10/E-15 etc you don't know unless you check it. Being the carb person you are I would wager your fuel system is more up to date than some folks just trying to keep an old rig running. My point being there are a lot of variables and it is case by case, location, environment etc. I have ran E-Fuel without problems too...however I will absolutely not run it in a 2stroke engine as I have seen many cooked from having water in them. My opinion is mishandling of your fuel storage and faulty tanks at stations is a lot of the issue where high amounts of water get introduced. Small containers get thrown outside, poorly sealed/vented, get rained on etc...throw that in a half gallon weed-eater tank and it is a recipe for issues....now mix that gallon or 5 with 10-15 gallons of fresh fuel in a vehicle and obviously the issue drops accordingly. Water in fuel is problematic in many ways and E fuels are more susceptible to it relatively speaking. I also thought I would pass along the neat trick of actually checking the fuel you get. The point I was trying to make, is if we are running 1960's vehicles in 2019, yeah some updates need to be made and we can certainly work with this fuel. The other point I was trying to make, is that often someone points to the fuel as the cause of an issue, when we have a design flaw in our installs. It seems a lot of folks take the stock 300hp engine, poke and stroke it, install a massive cam, and now are making 500hp, running the same timing curve, and wondering why the car runs hot, or won't restart when heat soaked. I can't tell you how many people in this past year I've run into running a big 427 and using stock timing specs because it was in the book. I do think the fuel test you outline is great, didn't mean to imply otherwise. Obviously fuel quality matters (especially for the small engines you mention). The ethanol in fuels absolutely causes me headaches at work, where I have about 40 pieces of equipment that are 2 stroke, mostly because they don't get ran through the winter months. Once that happens, the carbs are basically trash (too many minute passages and metering passages that can't be gotten to), so you just buy a new one. Sometimes I get lucky and can get by with running some fuel system cleaner through them. I avoid that problem at home by keeping all my 2 stroke stuff in heated environments through the winter months, and periodically starting them up for a minute or two. I tried running them dry before storage, but the residue left from the fuel seems to make the problem worse by doing that. Just my experience. I haven't really had issues with my cars and truck either. I don't know if it actually helps, but I always run a bit of fuel system cleaner through them at the end and beginning of driving season. I also put a can of fuel line antifreeze in them before storage. I think if you can keep the water/moisture in suspension, it helps minimize corrosion issues. That's just my theory, and I have no way to prove it helps, but I don't seem to have any problems. I also keep the tanks full during storage, which should be a given. Like Joe mentioned, location and local weather plays a big part in how the fuel reacts. I have an unheated garage in Ohio, so all my cars and truck, including my 8N tractor, sit in cold, with vast temperature variations and very high dew points to contend with throughout the 4-5 month storage season. That's why I go to the extent that I do to avoid problems. I also want to add that it seems like there can be vast differences in how carbs react to ethanol fuel, based on the quality of the aluminum used in the carb. I don't know what is good or bad as far as the materials used, but I see big differences between different manufacturers of equipment. I will entirely agree that fuel is the first thing folks think is an issue and most often it isn't. I normally verify fuel delivery then look else where. 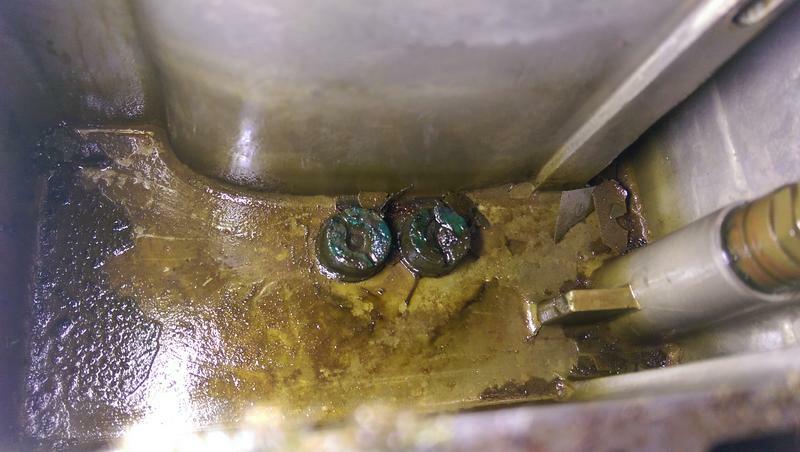 Get into the outboard 2 stroke world and it is even worse....most of the time when folks say the motor not getting fuel, it is really air getting into the system or an electrical gremlin. I would say about 40% of the time its a fitting leaking air and 60% of time electrical related. Obviously a general overview based on what I see/am told. We can also add to this discussion fuel additives. A new one on me was on my Kawasaki 700 ATV. Carbs were acting up, rebuilt them, ran great for a week or so, then the issue reappeared but a little different, now it was acting up on top end instead of through the entire range....thought I would try some Royal Purple Carb treatment fist knowing it was probably some debri or electric....it is a pain to pull the carbs off....well in the end I went back into it...my jets were completely corroded....went from dull brass to green/corroded....I don't know if it was Stabil mixed with RP or what "actually" caused it but they went from nice to horrible in less than a month. Just finished them two days ago....sonic clean, drained fuel system and now straight fuel....back in action for now. Lesson learned...I knew better really but laziness got the best of me. Ended up finding a seat had worked itself a little loose from the housing on the air/needle jet thingamabobby and was allowing unmetered fuel in at full juice. Fun stuff. my jets were completely corroded....went from dull brass to green/corroded....I don't know if it was Stabil mixed with RP or what "actually" caused it but they went from nice to horrible in less than a month. This was longer than a month, but the same fuel issue from sitting without taking precautions. It was NOT easy getting the jets cleared out!